ADAM Audio has been producing world-class speakers for almost two decades and has quickly become an industry favorite since it’s foundation in 1999. Their products provide an amazing sound, durability, and versatility — offering options for every pocket and application with their three monitor lines: The high-end S series, the mid-range AX series, and the budget T series. In this review we are going to take a look at the A7X, ADAM’s best selling near-field monitor and staple in many professional, well-renowned studios, as well as home studios since its introduction in 2010. 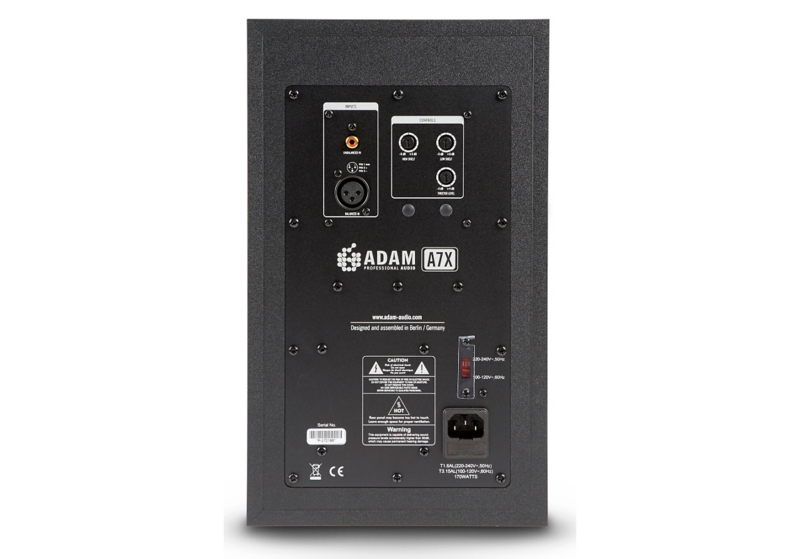 The award-winning A7X came as completely re-designed update of the original ADAM A7 monitor; with some attractive external attributes such as front-facing ports — for against-a-wall/corner positioning, a power switch and gain control (-60dB to +14dB) on the front of the monitor, also the famous “ribbon tweeter” sitting close to the front face of the cabinet. At the rear of the A7X, we can find an unbalanced RCA input, a balanced XLR input, low shelf gain/cut (±6dB), high shelf gain/cut (±6dB), and tweeter gain/cut (±4dB). These last three settings are fairly simple and straightforward, yet flexible enough to adjust and adapt to you room type. Inside of the A7X we can find a 50W A/B class amplifier designed for the high frequencies, and a 100W PWM amplifier for the low frequencies. These two provide a very clean and subtle reproduction of mid-range frequencies with a seamless transition in the crossover between the 7" HexaCone woofer (Carbon/Rohacell/Glass Fiber), which operates in the range of 42 Hz to 2.5 kHz, and the X-ART tweeter. In reference to the latter, ADAM’s X-ART (eXtended Accelerated Ribbon Technology) tweeters are individually handmade, and include their HPS (High-frequency Propagation System) waveguide, which provides a better propagation consistency within the horizontal axis, in addition to an extremely tight dispersion along the vertical plane. This is important for a near-field monitor to reduce sound reflections and to provide an accurate stereo image even at high SPLs (sound pressure levels). Last but not least, the X-ART tweeters are engineered to reproduce frequencies all the way up to 50 kHz, which can be helpful to easily produce sound at 20 kHz (limit of human hearing range) without any distortion or harshness. All the characteristics mentioned before are definitely good selling points for the A7X, especially the promise of getting a whole spectrum of crisp and clear frequencies— but you might think that a top-quality monitor with a great and innovative design might be out of your reach, right? After all, a product line associated with names such as Sebastian Ingrosso and Chromeo might not be the most affordable. Well, let me tell you that you won’t have to spend all your life savings on this one, it can be yours for only $749.99 each/$1,499.00 for the pair. Another great thing about the monitor is its size. The A7X has a height of 13.5″, 8″ of width, and a depth of 11″ -- this along with the front-facing reflex ports makes it a perfect choice for smaller rooms, allowing enough freedom to try different positioning or configurations to take as much advantage as possible of the surrounding elements and dimensions of your space. A remarkable feature of the A7X is the fact that it’s modular-built; this means that the components can be easily and individually replaced or removed for servicing if needed, which is a common feature of most high-end products — rarely found within its price range. Additionally, ADAM Audio has a valuable warranty to back their products, no matter the line you get. It’s technically a 5-year warranty; 2 years with the purchase and if you register the monitors, they will automatically add 3 years on top of that. It’s hard to find weaknesses when you have such a great product in your hands; that being said, the A7X might not be for everyone or could be too much for some. Previous experience with near-field monitors will definitely be helpful to really take advantage of the AX7’s capabilities, especially when it comes to the set up. Beginners could feel challenged by the variety of configuration options; however, this shouldn’t be setback— the best results usually come with time and experimentation. Also, even though I consider that the price tag is fair for the level of product that we are getting in exchange, this might be subjective. It is clear that the A7X is more expensive than many comparable-sized powered monitors, but few can bring to the table as much as ADAM in this case. I invite you to read and analyze all the specifications, talk with other users, or to try them out in person if possible—a firsthand experience is the best way to decide if a product is a good investment; but for many, this one is worth every penny. 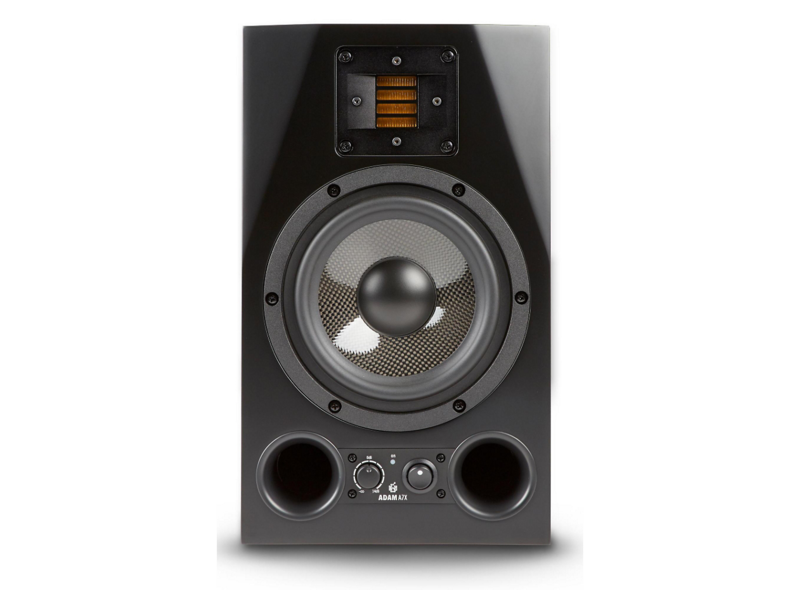 The mid-range monitor market is extremely competitive and if you’re looking for a solution that will substantially improve your mixes, consequently making your ears happy for a long time, then the ADAM A7X monitor is a safe bet—the hype is real with the AX series. It is a great fit for all type of users, especially professionals that might be on a budget but don’t want to sacrifice sound accuracy, build quality, and overall durability by any means. The A7X looks good, sounds great, and can be as versatile as you want it to be. Versatile and great for smaller rooms and peculiar configurations. Great mid-range and stereo imaging. The X-ART technology really stands out. Widely used in the industry, in both professional and home studios. More expensive than many comparable-sized powered monitors.